[S1698] Anna (avipe), "Magnus Gunnerson/Gummesson," e-mail to Julia Langel, July 21, 2008, Magnus Gunnerson/Gummesson. 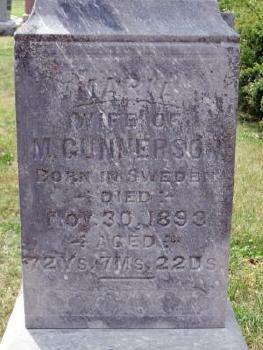 [S1921] Magnus Gunnerson and Maria Gunnerson Cemetery Marker, Assaria Evangelical Lutheran Church Cemetery, Assaria, Saline Co, KS. [S681] Ruth Hays, "Ruth Hays FGS", Youngberg -- Gunnerson. [S2377] Kronoberg County, Sweden Tolg Parish, 1855 - 1863, Husforhorslangder, vol A1:14:356, Utflttade. [S402] Book, Into One Body , this source says May 21. [S2] William G. Cutler, History of the State of Kansas, McPherson County, Lindsborg, page 5. [S1256] 1900 U. S. Census, Minnesota, Chisago County, Franconia, ED 5, sheet 9B, line 94, dwelling 169, family 173, Minnesota, Chisago County. [S1848] [database on-line] Ancestry.com Soundex Index to Naturalization Petitions for the United States District and Circuit Courts, Northern District of Illinois and Immigration and Naturalization Service District 9, 1840-1950, NARA M1285, roll 142, no. P-652, Provo, UT. [S8] 1875 Kansas Census, Kansas, Saline County, Liberty Township, page 10, line 23, Kansas, Saline County. [S13] 1880 U. S. Census, Kansas, Saline County, Liberty Township, ED 44, p 22, line 5, Kansas, Saline County. [S15] 1885 Census -- Gunnarson.